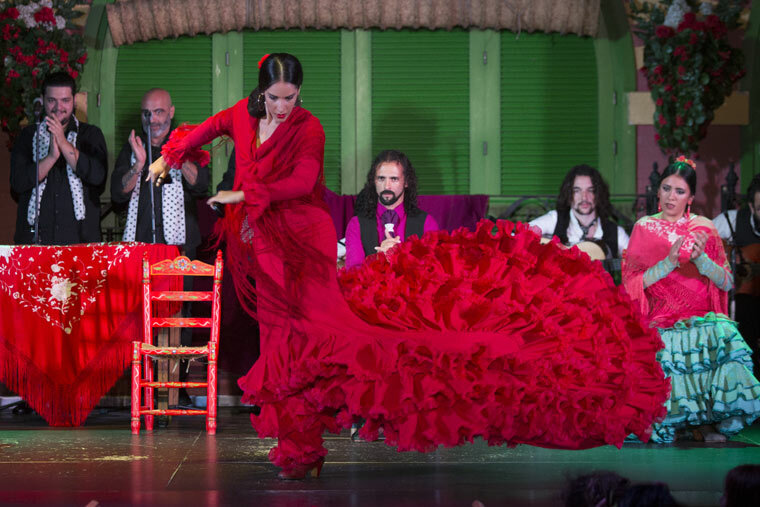 Few regional costumes are as recognizable as the flamenco dress or gypsy dress. It is an outfit that reflects the identity of the Andalusian culture, a dress that is present in the traditional festivals and pilgrimages that are celebrated in Andalusia. The flamenco dress, also known as sevillana dress or gypsy dress, is also the clothing that flamenco dancers wear is their performances and is one of the most characteristic and colorful elements of this universal art. We can say that it is the only Spanish regional costume that has evolved over time, becoming a benchmark of Spanish culture and a fashion icon, since each year the flamenco dress is renewed and reinvented with new materials, accessories or prints. Although at present, the gypsy dress has crossed borders and is an outfit worn by women from all over the world, the origin of this dress is humble. Its roots are in Seville and in the custom that had the peasants and gypsy women, of the late nineteenth and early twentieth centuries, to wear a robe with ruffles as a uniform to do their chores. These women had the habit of adding to the dressing gown, ruffles, embroidery and colors, some garments that did not go unnoticed by the ladies of the high society of that time. But if we have to look for the moment in which the flamenco dress began to become popular, we must go back to 1847. In that year, on the occasion of the April Fair of the cattle that was celebrated in Seville, many gypsy women accompanied their husbands and wore these peculiar outfits to show off at the event. What at first was a cattle fair with time turned into an encounter for the party and the leisure and those smocks with ruffles, polka dots and embroiderings that the women of the cattle dealers wore, became object of attraction for the ladies of high society. Little by little, the dress worn by the gypsy women became the ‘official’ dress to go the fair. It was from 1929, during the Ibero-American Exposition, when its use became ‘official’, thanks also to the professionalization of flamenco, which took this outfit as its own. But not only became the official dress to go the April Fair in Seville, but the use of flamenco dress crossed borders and also began to be part of fashion, evolving and adapting to the times, while always maintaining a series of characteristics faithful to its origin. It is a dress that has been transformed over time based on fashion. It is a long dress, which usually has a marked neckline in beak, round or square, hugging at the waist and then open at the hip and up to the ankles. It is adorned with ruffles on the skirt and sleeves. They usually wear bright colors and the most typical print is polka dots, although there are also plain ones. When a woman dresses in flamenco, the usual thing is to make a bun and wear a series of accessories that are essential to wear the dress well. The shawl, the flowers in the hair, the earrings, the necklaces, the bracelets or the combs are fundamental elements that accompany the flamenco dress, to which must be added other accessories such as heels or a fan. The popularity of flamenco dress is such that, today, you can choose from a wide range of dresses and accessories. It is the usual clothing worn by women in the fairs and pilgrimages that are celebrated in Andalusia, but it is also a dress that is worn on special occasions or events. There are many types of dresses depending on the utility. 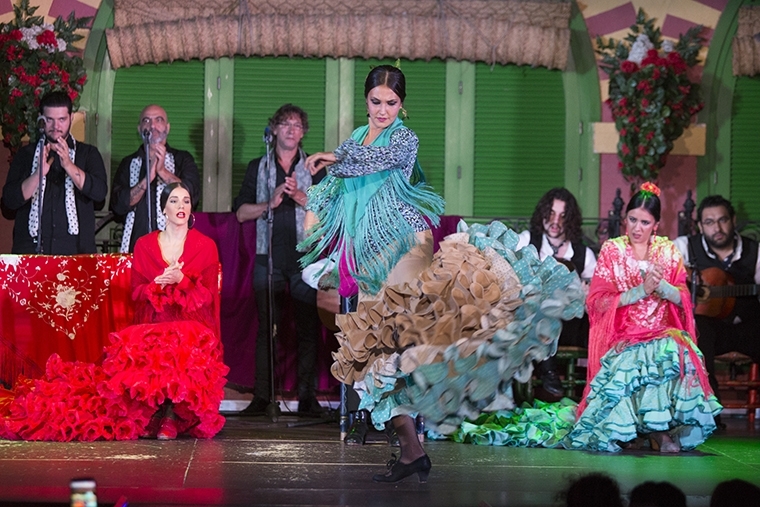 In the flamenco shows, the dancers usually appear with dresses and flamenco skirts, with tail and without tail, depending on the type of dance that they interpret. Seeing an artist move her skirt or flamenco dress during the dance is a real marvel, especially when accompanied by a singer and a live guitar. 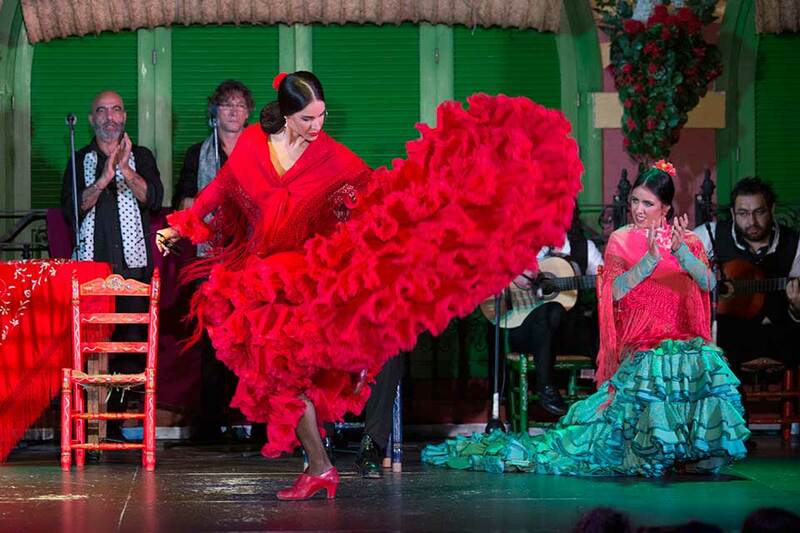 In this type of dress, the bailaoras know that every night they give life to our flamenco show. During the show, our audience can see the different types of dresses our artists use to interpret the different flamenco styles. And how do they move it? 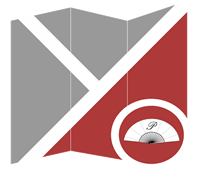 You have to see it! 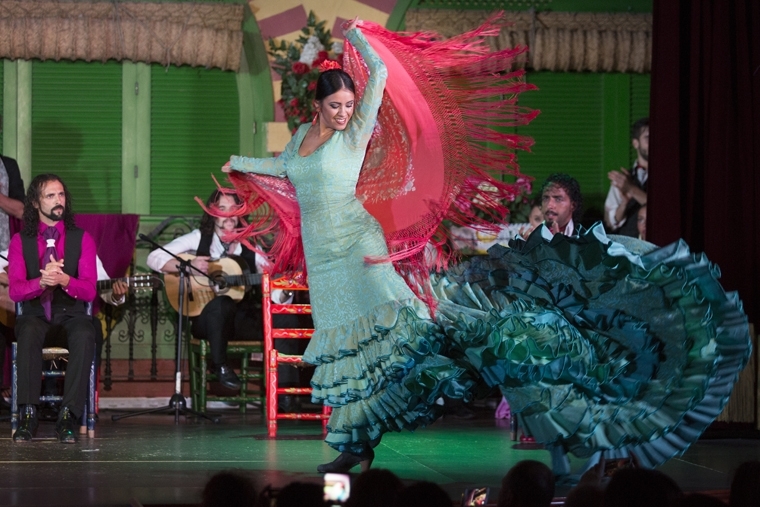 If you plan to visit Seville, take note of our proposal and come and see one of the performances we celebrate every day at El Palacio Andaluz. 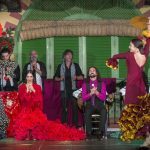 A show that is unique in Andalusia and where you can enjoy an icon of Andalusian and Spanish culture: the flamenco dress. We will wait for you!